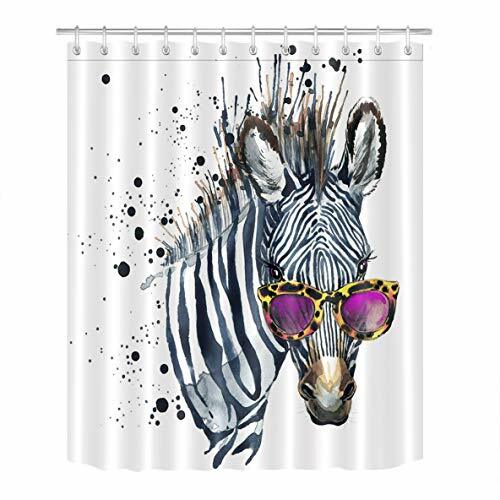 Made by environmental friendly material with most advanced printing technology, our shower curtain product is harmless to your family health, and they are durable and the lifelike printing will draw your attention every time you enter the bathroom, it is a piece of art, you will get compliments from your friends! We have thousands styles for you to choose from, come and pick a perfect match to your taste, you will always find the one here. If you don't want to spend much time maintaining a shower curtain, choose material like polyester, nylon, etc. Pick a style can match color scheme/theme of your bathroom. Choose extra wide size to avoid opening and keep water inside. Please notice the existence of slight color differences and size error. Please share your feeling and leave a feedback if we make you happy! STANDARD SIZE: 72 inches wide x 72 inches high. FABRIC TYPE: polyester fabric, water repellent, mildew/mold proof, no liner needed. Machine washable, stain resistant, easy cleaning and maintenance. HEALTHY: non PEVA, non toxic, no dyes, no harm. ACCESSORIES: 12 stainless metal grommets mounted, includes 12 pieces plastic curtain ring hooks, easy to hang. ATTENTION: THIS ITEM WAS SOLD BY 'BathStation' EXCLUSIVELY, OFFERS FROM ANY OTHER SELLERS ARE FAKE. PLEASE NOTICE, DON'T BE DECEIVED BY CHEAP OFFERS FROM UNAUTHORIZED SELLER, YOU MAY GET EMPTY PACKAGE OR LOW QUALITY ITEM.